In an electric distribution utility system flexibility and reliability are of utmost important. That goes true with Cotabato Light where service area includes Cotabato City and some areas in the municipalities of Sultan Kudarat in the north, and Datu Odin Sinsuat in the south. 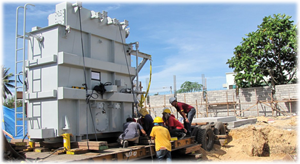 The substations that share the loads in its franchise area are the 12MVA Sinsuat substation within the utility’s compound and the 10MVA & 15MVA Salimbao substation located at Sultan Kudarat. As of 2010 data, the 12MVA Sinsuat substation is being loaded to as much as 94.66% of its capacity and having percent load factor of 70.66%. Undeniably, proper reporting and documentation are vital functions in every offices, more so with our policemen who make lots of blotter reports and documentation. Thus, computers and printers are needed in the office, and SK-PNP is among of those that needs such valuable equipments. Seeing such opportunity to be of help, Cotabato Light is quick to provide the solutions by donating two brand new LX-matrix computer printers worth Php 16,000. 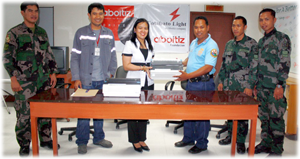 Previous years, the said police office was also the recipient of three brand new computers with printers from Cotabato Light and Aboitiz Foundation. One TV ad says “…sa panahon ngayon bawal ang magkasakit”, well practically its true considering the physical and financial impact brought by it. Indeed health is wealth. Recently, a new virus causing illness in people was discovered. It is called Influenza A (H1N1) and it is fatal to human due to severe respiratory distress (pneumonia). According to Department of Health (DOH) website, this new virus was first detected in people in April 2009 in the United States. This virus is spreading from person-to–person, probably the same way that the regular seasonal influenza viruses spread. Corporate Social Responsibility(CSR) goes beyond a mere Philanthropy, it is giving back to society with involvement,” says Mr. Jon Ramon Aboitiz during his Opening Remarks in the CSR strategic planning of the Aboitiz Foundation with the Power Group held in Makati last January 6-7. 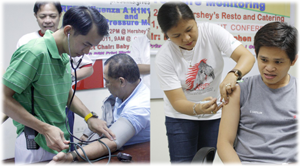 In Aboitiz, we would assure that we are a company that shares and serves. CSR is being promoted as an integral part of power brand with “One Team, One Vision”.